Park your car on level 6. Find your way onto level 7. Et voilà! You have arrived. Bold Tendencies is a non-profit summer project in a disused multi-storey car park. Their mission is to commission world-class, site-specific visual and performing arts in Peckham. The mission statement should have included performing in unorthodox venues (an unused car park certainly qualifies as one). It all began in 2011 with 100 musicians performing Stravinsky’s The Rite of Spring. Today, a series of concerts are planned throughout the summer, beginning on June 20th with a performance of Symphony no.5 by Jean Sibelius, with a repeat of the same work the following evening. On 26 July, the car park will return with a performance of Dmitri Shostakovich’s Cello Concerto no.1, featuring internationally renowned solo cellist Matthew Barley. The series wraps up with two shows featuring the work of Dutch composer Louis Andriessen, whose most famous piece, De Staat (The Republic, based on the writing of Plato), will likely never have been played in more unusual surroundings. 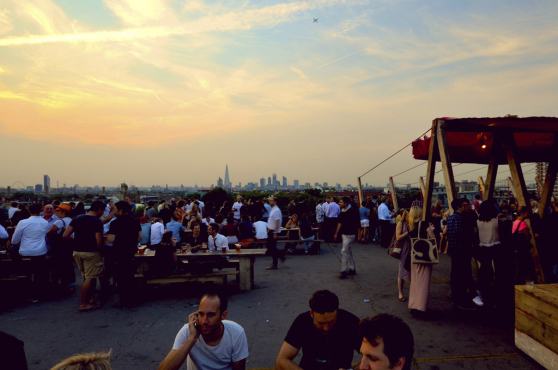 The evening has not ended until you pop up to the roof of the car park where you will find Frank’s Café. Frank’s Café is the flagship architectural commission of Bold Tendencies in Peckham. The bar was designed by Practice Architecture (Paloma Gormley & Lettice Drake), and opened in 2008 by bartender Frank Boxer and chef Michael Davies. Spectacular view, lively atmosphere. Head chef Amir Pem leads the kitchen team. Amir has 15 years of culinary experience in high end kitchens around the globe, and is a Peckham local having grown up in the neighbourhood. Classic culture meets Peckham nightlife all under one roof. Children and dogs welcome! Saturday – Sunday 11am – 11pm. Did you say Peckham?!!!!!! :)))must be wonderful on a hot summer day, thank you!